An air defence division armed with Tor-M2U system has been deployed to Donbas. Russia has deployed to Ukraine's Donbas an air defence division of the 60th detached motorised rifle brigade that is capable of taking down aircraft, including civilian ones, the Ukrainian Defence Ministry's Main Intelligence Directorate has said in its report. "We interpret the redeployment of an air defence division of the 60th detached motorised rifle brigade as an increased threat of air terrorism for all aircraft, including civilian ones, given the infamous terrorist act committed by the Russian Federation, which resulted in the tragedy with the passenger Boeing 777 aircraft of Malaysian Airlines flight MH17," the report reads. Ukrainian military intelligence has established that the air defence division of the 60th detached motorised rifle brigade (Monastyrishche-2, Maritime Territory) of the 5th combined-arms army (Ussuriysk) of the Eastern Military District of the Russian Armed Forces includes 168 people, 21 items of military hardware and 30 cars. Its personnels includes officers and contract servicemen alone, including those transferred from other brigades of the 5th army. The commander of the division is Russian Armed Forces Maj Yuriy Vladimirovich Korchinskiy. The chief of air defence and head of the air defence unit of the 60th detached motorised rifle brigade, Russian Armed Forces Lt-Col Sergey Aleksandrovich Tupichenko, oversees this unit's use in combat. "The division is equipped with the advanced and potent air defence missile systems Tor-M2U which are no less effective in combat that the Buk air defence system which a Russian crew used to shoot down the Malaysian Boeing 777," the Ukrainian intelligence said. Before its deployment to Ukraine, the air defence division is known to have had additional training near Novocherkassk, Rostov Region where the Territorial Troops Centre of the Russian Armed Forces' Southern Military District is located. The Ukrainian intelligence said that for the purposes of military deception, the division personnel was issued with cover-up documents and provided with relevant legends. "The Russian Federation has used this practice since the beginning of the armed aggression against Ukraine," the Ukrainian intelligence said. The Ukrainian Defence Ministry's Main Intelligence Directorate has published the full list of the personnel of the mentioned division, indicating their names, personal information and posts. 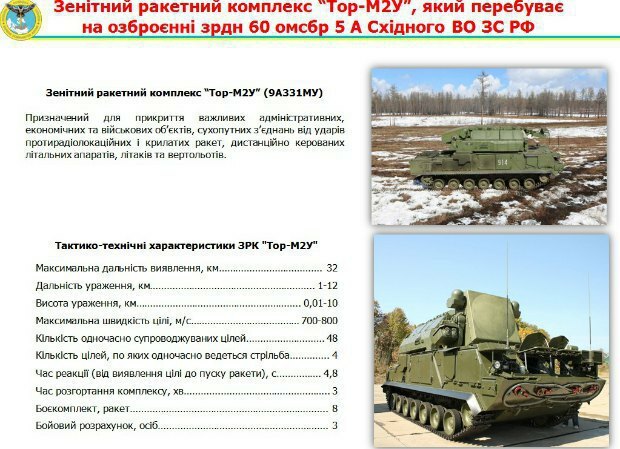 The Buk-M1 air defence system, board number 332, of the 53rd air defence brigade of the Russian Armed Forces, normally stationed in Kursk, was brought to occupied Donetsk Region and was later used to shoot down the Malaysian MH17 passenger plane Boeing 777.